Hoxton Hall was originally built in 1863 by James Mortimer, in the traditional music hall architecture style, with the intention to combine instruction with amusement. When the hall was first built it was named Mortimer Hall. The hall was bought by James McDonald in 1866 and renamed McDonald’s Music Hall, where it continued to be an affordable venue to entertain the working classes with acts including music, circus and even performing dogs! McDonald’s Music Hall was quite a success and many of Music Hall’s major names played there in its early years. Such was its popularity that in 1867 McDonald enlarged its capacity by raising the height of the Hall, adding a new upper balcony, and extending the previous rear balcony along both sides. Music Halls originated in the 19th Century in taverns and saloon bars offering food, drink and entertainment. As their popularity grew, purpose-built buildings began to emerge, the Britannia Theatre in Hoxton opened in 1858 as a lavish purpose-built venue, entertaining the likes of Charles Dickens. Hoxton Hall, opened a few years later, in 1863, a more modest hall, built by James Mortimer and later owned by James McDonald. Unfortunately, the music hall era didn’t last long and by 1871 McDonald lost his licence. From 1878 Hoxton Hall was home to the Girls Guild for Good Life. The group was founded by Sarah Rae, who was the wife of the secretary of The Blue Ribbon Temperance Society, who ran the hall when she began. The club ran for many years, well into the mid twentieth century and had a substantial impact on the lives of local women. These clubs were popular in the latter half of the 19th century and were largely intended for working girls in an attempt to steer them away from ‘undesirable’ pastimes such as drinking and gambling. Classes such as cookery, dressmaking and elocution were on offer with a view to make them ‘good wives for working men’. Although now, we might view such clubs as offensive and perpetuating gender roles, at the time they were seen as progressive feminist work. 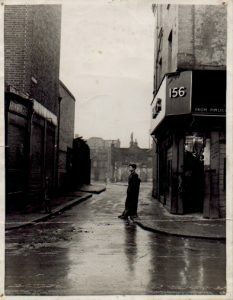 Hoxton Street has long flowed with alcohol and the entertainments that come with it; an antidote for the drudgery of a poor existence but also a fuel for the social ills that accompanied it. The Blue Ribbon Gospel Temperance Mission moved into Hoxton Hall and managed the property between 1879 and 1893. They were an international movement that promoted sobriety. In their time at the hall, they programmed nightly meetings, special events and talks, and reached out to local people through social work and community engagement. Whilst their time at the hall was relatively brief, their legacy had an impact on the future direction of the hall – many of the members of the temperance mission remained involved in the hall when it reopened under the Bedford Institute, and their commitment to community engagement and development has been continued throughout Hoxton Hall’s history ever since. During both WWI (1914-1918) and WWII (1939-1945), residents living in Hoxton – like those across the country, feared the attacks from the air. During WWI, whilst German Zeppelins dropped bombs on the city, Hoxton was never a target and therefore it was left unscathed. However, its residents were still embroiled in the war effort, many risking their lives on the front or at home working in munition factories and as a result local families still suffered heart-breaking loss. During WWII bombs pummelled Hackney, wiping out many local houses and public buildings, including the Britannia Music Hall. During the wartime years May Scott joined Hoxton Hall and it is partly due to her hard work and determination that activities for the local community continued throughout the war offering them a ‘warm and cheerful home’ and the basement as an air raid shelter. Miraculously, the Hall survived WWII undamaged. The development of Hoxton Hall’s current community arts programme owes a sincere debt to the energy, compassion and creative thinking of May Scott, who joined Hoxton Hall during WWII and became warden in 1957. In the decades following the war, the hall was both a community resource with various classes and activities but gradually the music hall at the centre of the building started to reassert its influence. The 1960’s saw the beginning of Shakespearian productions created and staged at Hoxton Hall and many individuals and groups found room here to experiment and grow. Today our varied programme of professional shows, alongside our youth arts work and heritage events are testament to the rich and varied past of Hoxton Hall. Hoxton Hall has been the pillar of the Hoxton community for many years, and has seen many changes reflecting the diversity and voices of the people of Hoxton. This has all been under the direction of key strong leaders and groups. Click here to see a full list of all the key holders of Hoxton Hall, and how they have contributed to this wonderful building and community. Hoxton Hall is known as one of London’s best-loved performance venues. Our quaint and charming hall provides an intimate and cosy space for gigs and comedy shows, as well as a unique space for photo and film shoots. Over the years the hall has had the pleasure of hosting some famous names and been the set for some great films and videos. Click here to see the list of those who have graced the stage. People from all backgrounds have at one time or another been drawn to Hoxton and as a result it has seen numerous changes over the centuries both demographically and architecturally. Its location, just outside the city, has had a huge influence on the changes it has seen over the years. In 1552 when it was little more than a small village it had seven ale houses, including Pimlico; a place where travellers rested after long journeys and people from all walks of life came to drink. In the later half of 1500’s, after the Lord Mayor banned strolling actors from the city, purpose built theatres began to emerge in the area and entertainment was sought in both these and the local taverns. 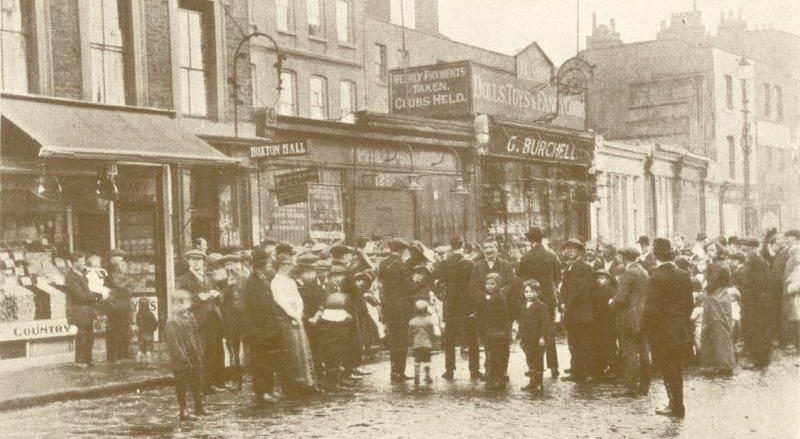 What was once a country retreat and playground for the city’s gentry during Tudor times became the overcrowded working class slums, where poverty was rife, in Victorian times. In 1816 Hoxton was home to three madhouses, with characters like ‘Doctor’ at their helm, a man with no medical training but who struck fear into the heart of the patients through his ‘bestial’ practices. Hoxton has been subject to a period of rapid change over the last century or so, and in turn, Hoxton Hall, has evolved throughout the years to match the changing needs of local communities – shaping its programming to reflect new and diverse audiences on an ongoing basis.